A Gothic Revival fire basket and associated fire dogs by William Burges for Hart, Son & Peard. 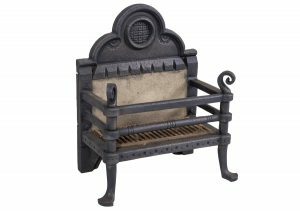 Grate Ht: 22 ½ " W: 20" D: 12 ½"
Dogs Ht: 24" W: 12" D: 15"
A Gothic Revival fire basket and associated fire dogs. We can advise options for both home and export.